Introduction: Louisiana was a fulcrum of Native American activity. The geology of the area was such that a prairie terrace was created by the actions of the Red and Mississippi rivers between 80,000 and 100,000 years ago. The abandoned channels left by these two rivers created a great ecosystem for Louisiana’s future inhabitants. The Mississippi River started to meander eastwards just south of Natchez Mississippi between about 4000 to 2500 B.C. and ended it movement and attained it’s present course in about 800 B.C. The old Mississippi River channel bordering the Marksville site became the Old River. 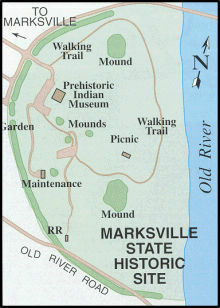 The Marksville site is located in Marksville, La. · 1699- The French explorer, Iberville was given Tassenogoula (mobilian name for Avoyel) for the name of the Red River. · 1700- Iberville met about 40 Avoyel warriors and gave the name, “Little Taensa”. · 1714- St Denis met the Avoyel on his way to Mexico. Penicaut who accompanied St Denis calls them “Tassenogoula”. · 1718- La Harpe’s journal while on a voyage up the Red River calls them “Tamoucougoula Nation; otherwise called the Anoy”. · 1734- In Du Pratz’s “enumerations of the tribes of Louisiana, above the rapids (Red River) and on its banks there is a little nation known as the Avoyels”. · 1736- Father Antoine Senat was burned at the stake by the Chickasaws. An Avoyel woman who was a prisoner of the Chickasaws witnessed the incidence. 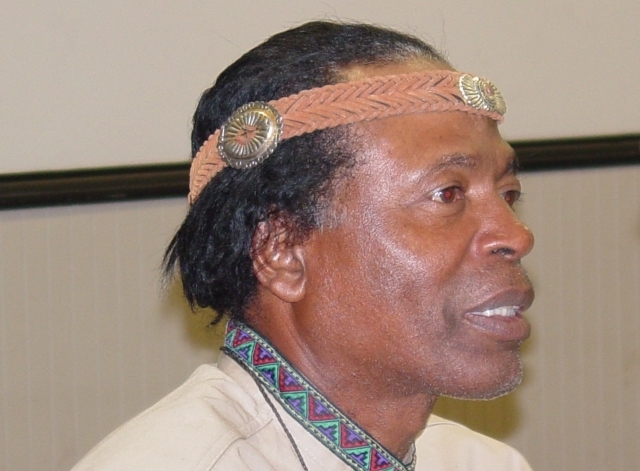 A Chickasaw Chief named ‘Mingo Ouma’ verified the Avoyel’s woman story. · 1764- In conjunction with the Ofo, Tunica and some Choctaws, the Avoyel attacked a British Regiment on the Mississippi River and forced their retreat. · 1767- George Morgan who descended the Mississippi River reports, “about fifty leagues up the river in the rapids, an Indian village of the Avoyelles tribe”. · 1805- Sibley claims that except for two or three women who did recently live among the French inhabitants of Washita, the tribe was extinct. · 1908- Swanton found a Tunica Indian whose grandmother was an Avoyel, called in Tunica Shi xkaltini, “Stone-Arrow-Point-People”. Swanton also heard from others the Avoyel claimed to have issued out of the earth at a place now occupied by a lake. Long before pulp wood trucks roamed the rolling hills of Central Louisiana in search of the pine trees for lumber, sassafras trees were the pride of the southern forest. Like most native tribes in Louisiana, the Avoyelles-Taensa Tribe used sassafras products in cooking, medicine and in scented household goods. Young men begin digging the root in April or May when it was popularly used as a Spring Tonic. The Roots were usually washed and steeped in hot water before drinking. Sometimes village craftsmen also brewed sassafras in honey to make sassafras syrup or fermented the root to make wine. The aromatic leaves were also used to season stews; which are now referred to as gumbo. The plant's sweet aroma was often used to add flavor to cakes, potpourris and candles. Sassafras leaves and twigs are consumed by white-tailed deer in both summer and winter. In some areas it is an important deer food. Sassafras leaf browsers include groundhogs, Marsh Rabbits, and American Black Bears. Rabbits eat sassafras bark in winter. American Beavers will cut sassafras stems. Sassafras fruits are eaten by many species of birds including Bobwhite Quail, Eastern Kingbirds, Great Crested Flycatchers, Phoebes, Wild Turkeys, Gray Catbirds, Northern Flickers, Pileated Woodpeckers, Downy woodpeckers, thrushes, vireos, and Northern Mockingbirds. Some small mammals also consume sassafras fruits. Sassafras trees grow from 30-59 feet tall and spread 25-39 feet. The trunk grows 28-59 inches in diameter, with many slender branches, and smooth, orange-brown bark. The branching is sympodial. The bark of the mature trunk is thick, red-brown, and deeply furrowed. The wood is light, hard, and sometimes brittle. All parts of the plants are very fragrant. The species are unusual in having three distinct leaf patterns on the same plant, unlobed oval, bilobed (mitten-shaped), and trilobed (three pronged); rarely the leaves can be five-lobed. They have smooth margins and grow 7-20 cm. long by 5-10 cm. broad. The young leaves and twigs are very mucilaginous, and produce a citrus-like scent when crushed. The timy, yellow flowers are five-petaled and bloom in the spring; they are dioecious, with male and female flowers on separate trees. The Fruit are blue-black, egg-shaped, 1 cm. long, produced on long, red-stalked cups, and mature in late summer. The Avoyel-Taensa Tribe also used sassafras for stomachaches, gout, arthritis, high blood, rheumatism, kidney ailments, colds, fevers and skin problems. Other local herbs used by the tribe include: pokeweed, yellow dock, pine bark, cherry bark, bitterweed, magnolia bark, castor oil root, cat tail, oak bark, clover leaf, currant and ash bark. Disclaimer: This article is for historic and cultural information only and is not intended to diagnose or treat any disease. By: Tribal Members Sharon Bize Greenhouse & brother (not photo'd) Bobby Bize. From Historical times to the late 1800s the Avoyel Natives lived at the main village, which extended from where the State Commemorative Area in Marksville, Louisiana is located today to a place called "Les Rapids" where the City of Alexandira is today. The Avoyel Natives acquired their name "Avoyel" because it signifies "People of the rocks" which was very likely applied because they were the middlemen in supplying the Gulf Coast Tribes with. the Flint rocks. They were producers and traders of stone projectile points (which was used for knife blades and arrow and spear heads). The Avoyel Natives never traveled far from their home territory, therefore they became traders with the other Tribes after European contact. The Avoyelles were able to gain wealth and power through trading horses and cattle imported from Mexico and Texas. The trading role of the Avoyel Natives was reinforced by their location. It was the Avoyel Tenitory, in later years, that constituted the land bridge which was a constriction of the drainage system across the swamps West of the Mississippi River. This land bridge is what horses and cattle stolen from Spanish Texas were driven East on. The Tassenocogoula (our name in the Mobi lian trade language meaning Flint People) is now perpetuated in that of Avoyelles Parish, Louisiana. Iberville first mentions the Avoyel-Taensa in 1699-1700 when he calls the the "Little Taensa". At this time, according to Iberville, the Avoyel-Taensa peoples numbered about 280 people with around 40 of them being waniors. 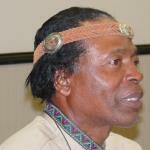 In historic times a Tribal Chief was the leader of the Tribe. The Tribe was divided into Clans with each having a Clan Chief. Today a Clan Leader is a Tribal Council Member. The Council is the Governing Body of the Tribe. They pass and enforce Tribal Law among the Clans. They are headed up by the Tribal Counci l Board which consists of four members . We have written and enacted a Constitution and a set of By-Laws which governs our Tribe and is what we live by. Anyone who is caught endangering this Tribe will be brought before the Tribal Council for review of their actions and they may face charges as well. If found guilty, they may be banished and turned over to outside authorities, if necessary. In earlier times, the Avoyel-Taensa people lived in Clans and seemingly lived separate and dif­ ferent lives from each other. The children were taught by their elders and most did not attend any type of school because they were not considered an equal by the white people. They were discrim­ inated against and degraded openly. For these reasons, most of our ancestors were unskilled labor­ ers. Many of our elders have memories of the past that they have kept secret and are only now willing to share. They have preserved a wondrous and beautiful culture and have handed it down to us. Wi th the progression of time, some people began to accept races other than their own. The discrimination is begi nning to cease in its ability to rule people's minds. Our children are now allowed to get a proper education. Since the early 1970s, Clans have been coming back together. Today we have nine Clans in the Avoyel-Taensa Tribe and have bonded together to further protect our culture and to also teach oth­ers about our remarkable heritage. Approximately 95% of the Avoyel-Taensa Tribe live in the State of Louisiana with about 90% still living in Avoyelles Parish.